Brisbane’s popular Teneriffe Park is now stabilised for the future and contributing to a healthier Brisbane River following the completion of a $30,000 restoration project. Healthy Land and Water recently completed works to stabilise and restore eroded sections of the historic park as part of a project to enhance local creek systems and improve water quality in the nearby Brisbane River. Since 1925, Teneriffe Park has been a popular habitat refuge, walking trail and community space tucked away atop a hill in the densely-populated suburb of Teneriffe. 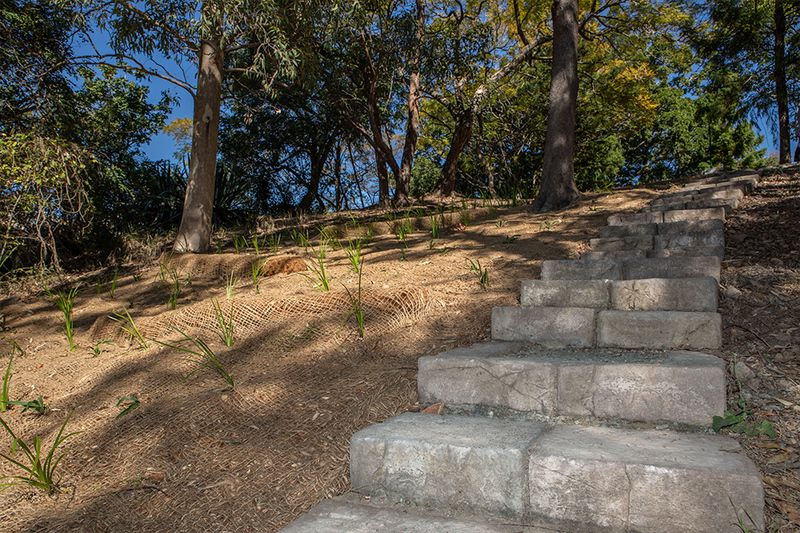 For many years, a previously-cleared slope on the southern side of the park has been used as a makeshift path by the community, which led to a significant erosion problem. As well as causing instability and safety issues in the park, erosion is a significant threat to the health of the nearby Brisbane River. When it rains, the displaced soil is washed into stormwater drains and ultimately into the river, where it affects water quality, muddies the water and smothers marine life. In partnership with the Australian Government, Brisbane City Council and Teneriffe Park Bushcare volunteers, Healthy Land and Water designed a plan to protect the park for the future. Erosion matting and coir logs were installed to keep the soil in place, and hundreds of local native plant species were planted to stabilise the slope. A pathway was also installed to improve the experience for park users. Healthy Land and Water CEO Julie McLellan said the Teneriffe Park restoration project is a major boost for the community and the environment. “We are very proud to be part of the restoration of one of inner-Brisbane’s most iconic and important community parks,” she said. “With the recent improvements, Teneriffe Park is now a greener, safer and more pleasant spot for the community to enjoy. Federal Member for Brisbane Trevor Evans said it was a privilege to work with Healthy Land and Water and local bushcare groups on such a vital environmental project. We’re very lucky to have such an important environmental asset like the Brisbane River on our doorstep, and it’s vital that we do all we can to protect it,” he said.